The Rotary Club of Oadby Launde is developing their Community Programme with a range of new initiatives supplementing work from previous partnerships. 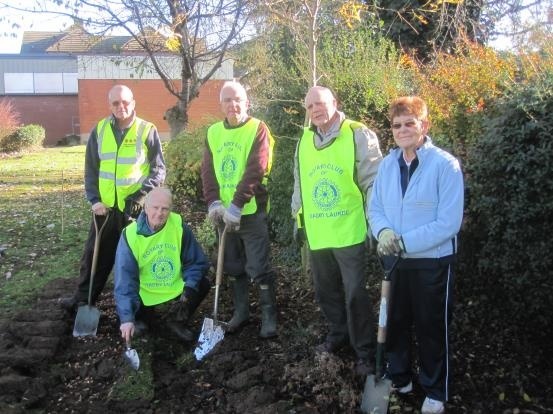 For many years, the club has worked with Oadby and Wigston Pride of the Borough Group, completing annual bulb planting and additional environmental schemes. Pictured are a group of Rotarians from the club with President Ian Bowler (kneeling) taking a break during Autumn bulb planting. The club is supporting The Lawns Nursing Home with a series of talks and presentations made by members of the club. These are intended to be both informative and stimulating, which will enhance the lives of the residents. 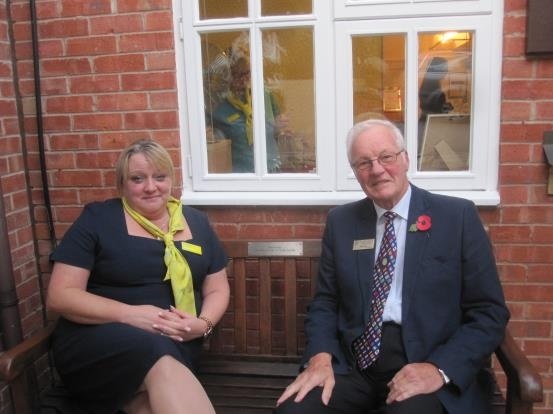 Pictured at their Autumn Open day are the Manager of The Lawns, Sam Towse and Rotary Community Officer, Tony Parr. Sitting on the Garden Bench donated to the home by the club. The Rotary Club of Oadby Launde is set to work with the trustees of Great Glen Community Libary, to develop the libary as a voluntary community facility. The club plans to help the trustees in develloping meeting facilities, IT and book resources and fundraising. The initiative, which will be run by the club as a major community project has already donated £450 to furnish the newly created patio area for meetings and leisure reading. Both parties see this as a long-term relationship, with a significant further fund raiser in the offering. The club's Foundation Officer, Barry Coleman, said, "With support from Rotary Foundation, we have been able to kick-startthis initiative, and it fits well within Rotary's involvement in local communities." Libary Trusttee, Vernon George, added, "We look forward to develloping a long-term partnership with the Rotary Club of Oadby Launde which will greatly enchance the community libary." Club President, Ian Bowler presented a cheque for £450 to Chair and Trustee of Great Glen Libary, Gill Townsend.